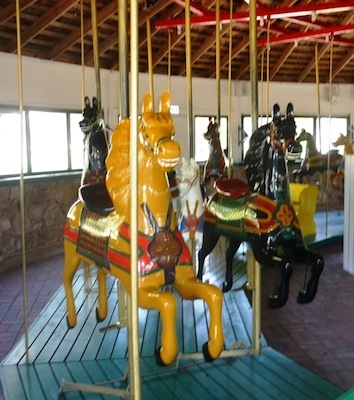 The carousel is a unique and historic antique. Remarkably, it has been operating in the same location for eighty-one years, delighting children young and old. Owned by the city and registered with the Smithsonian Institution, it is truly a Texas treasure. Of course, when visiting Brenham, especially with children, you just have to visit Blue Bell Creameries, home of Blue Bell Ice Cream. But to really put a gleam in the kids’ eyes, and possibly a tear of longing in yours, arrange to ride the old carousel. This carousel is one of the extremely rare remaining examples of a portable, turn-of-the-twentieth-century entertainment attraction. It was designed and built in the 1890s to be easily erected, dismantled, and moved from town to town by a traveling carnival. How did the carousel end up in Brenham? In 1932 a farmer who had agreed to store the carousel for a carnival promoter decided to throw it in his junk pile for nonpayment of the storage fee. Several citizens of Brenham went to the farmer and offered to move it for him. They took the carousel to Fireman’s Park and put the contraption together — and lo and behold, it worked. Since then, it has been one of the main attractions for children, teenagers, and adults who visit Brenham. The Brenham Carousel had been continuously in use for special occasions since 1932, and by 2006 had become pretty dilapidated. The entire apparatus was in desperate need of substantial repair. The money was found and the restoration done and it was returned to its original glory in two years. The city now has a working piece of history. The 18 horses on the carousel look just like they did when I was a kid. Surprisingly, during the restoration only a few of the wooden supports had to be replaced to bring it back to perfect working order. The original electric motor still runs the ride. An old sack filled with horse hair was discovered near the operating mechanism. The horse hair was used in the reconstruction of the horses. When you ride the carousel, look at and feel the tails of the horses. The hair of the tails is real horse hair! Only children thirteen and younger are allowed to ride on the horses. Folks fourteen and up are no longer allowed to ride them. They are, after all, antiques and not as strong as they once were. However, anyone can stand beside the horses and support the younger riders or ride on the bench gondolas. These rules are designed to protect this priceless treasure from damage, while still allowing it to make memories for the future. When traveling through Brenham, take the time to make some memories of your own. All the facilities in Fireman’s Park including the carousel can be reserved for private gatherings on special occasions. To find out about times and dates for viewing and riding the carousel, contact the Brenham Parks and Recreation Department at (979) 337-7250. Further information regarding the carousel and Fireman’s Park can be found at www.cityofbrenham.org.